Flannery Plant & Haulage Ltd has been established for 15 years as part of P Flannery Plant Hire Ltd, a family run company that has a long tradition in plant hire going back 45 years. 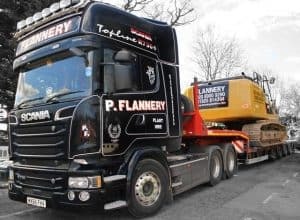 Flannery Plant & Haulage Ltd is involved with the heavy haulage areas of the business, providing expertise, experience and logistics to deliver heavy items of construction equipment across the UK to service major construction projects on behalf of our clients. We deal comprehensively with all aspects of this from planning, routing, dealing with various agencies and Police forces to obtain permits and ensure safe passage. We take a real pride in all that we do and that is reflected in the high levels of repeat business. No two jobs are the same and sometimes throw up some unique challenges especially when moving loads through our major cities. John Moran is our Senior Transport Manager and also our elected Fuel and Emission Champion. We came across FORS through involvement with Transport for London and clients on various projects in the capital. We studied the requirements and benefits of joining the scheme and could see the advantages this would bring to the business straight away. The scheme dovetailed perfectly with our ethos of improving fuel efficiency, reducing our environmental impact and improving safety for all. We take compliance very seriously and achieved our bronze and silver accreditation first time with the help of the extensive use of the FORS toolkits and training. John Moran has gone on to achieve his FORS Practitioner accreditation with the aim of taking us to the next level. Our aim is to achieve the very highest standards of FORS compliance and fully support the scheme. Without doubt FORS has been instrumental in improving the company’s operations in many areas. John Moran, Senior Transport Manager. All our drivers complete the Safe Urban Driving course and complete the e-learning modules every 12 months as well. We have made extensive use of the FORS toolbox talks which cover the related topic comprehensively but also get the point across very well. One of the benefits of using the FORS toolkits has allowed us to explore and demonstrate the benefit and importance of using the right truck for the right job. None so more than this has been able to highlight the reduction in fuel and CO saving in using a EURO VI 80 tonne truck for STGO work in place of an earlier 150 tonne models where the opportunity can be exploited. The difference is 36.77% fuel saving based on an average 65,000 miles per annum. The saving both in costs and emissions outputs are considerable. The use of the FORS toolkits allows this to be captured and demonstrated. FORS has been hugely beneficial to our company in many areas. Achieving FORS Gold represents a great achievement within our company and will enable us to continue going forward and improving.